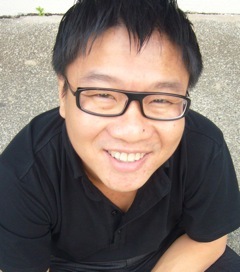 Desmond Kon Zhicheng-Mingdé is the author of The Arbitrary Sign and the forthcoming Sanctus Sanctus Dirgha Sanctus (Red Wheelbarrow Books), as well as I Didn’t Know Mani Was A Conceptualist (Math Paper Press). He has edited more than ten books and co-produced three audio books, several pro bono for non-profit organizations. A former entertainment journalist with 8 Days, Desmond has traveled to Australia, France, Hong Kong and Spain for his stories, which have included features on Madonna, Björk and Morgan Freeman, culminating in the authorship of the limited edition Top Ten TCS Stars for Caldecott Publishing. Trained in book publishing at Stanford University, Desmond received his theology masters (world religions) from Harvard University and fine arts masters (creative writing) from the University of Notre Dame. He is the recipient of the PEN American Center Shorts Prize, Swale Life Poetry Prize, Cyclamens & Swords Poetry Prize, Stepping Stones Nigeria Poetry Prize, Notre Dame Poetry Fellowship, NAC Writer-in-the-Gardens Residency, Vallum New International Poetics Award, Singapore International Foundation Grant, and Little Red Tree International Poetry Prize. His poetry and prose has placed in literary competitions in Canada, England, France, Greece, Ireland, Israel, Nigeria, Scotland, and the United States.